​Having been with you all at Christ Church for over five years means that June and July will include a longer break for me than usual. Thanks to your generous provision, each year I have received leave-time for vacation and continuing education. This year, in addition, I will also receive the first of three sabbatical months as provided in our Letter of Agreement. Sabbatical leave for clergy after five years of service is standard in the Episcopal Church; however, instead of receiving it all in one year, spreading the sabbatical over three years seems a better fit for Christ Church and for me. In this, I am following the precedent of your former rector, the Rev. Norman Macleod. So, I will be away starting from the afternoon of June 5, and return to our parish life in time for Sunday, July 31. Now, you may be saying, “That’s fine for you, but what about us?” Not to worry: worship, pastoral care, fellowship, and parish administration will continue. Our parish administrator Pat Wakefield will be in the office as usual, handling the day-to-day details of our parish life, and connecting you to clergy who are on-call for pastoral emergencies; our Senior Warden Pat Daunic will chair our June and July Vestry meetings, and help with questions that might usually go to me. Our Finance team -- Treasurer Ted Sands, Bookkeeper Melissa Lamoreaux, the Finance Committee, and Counters -- will continue their sound fiscal management. With the support of Pat Wakefield and Sexton Sheward Hagerty, Junior Warden Susan Shackford and the Vestry will continue their stewardship of our historic buildings and grounds, but without any interference from me. The Pastoral Care Committee recently baked and froze another round of meatloaves-to-go, as part of their continuing ministry of care and concern. As usual, Pat Wakefield can put you in touch with these compassionate friends. As for worship, our Music Director Mark Sullivan will be in the balcony to support congregational singing as usual, and to provide or accompany other inspiring music for reflection. June and July would be particularly good times for you to talk with Mark about sharing your musical gift in worship to God’s glory. Please also check in with the Altar Guild and be sure they have the help they need! I am very grateful that three terrific priest-colleagues have agreed to celebrate and preach in my absence. They are the Rev. Jane Stickney, the Rev. Kent Smith, and the Rev. Anne Richards. Many of you will remember the Rev. Jane Stickney from her years of service in Guilford at St. John’s Church, and for serving on occasion at Christ Church during the interim period before I arrived. Please take advantage of Jane’s wisdom and spiritual depth on June 12 and 19. On June 26 and July 3, the Rev. Kent Smith will again serve in his role as “Official National Holiday Supply.” You may know Kent+ and Margaret from their participation in the civic life of Guilford, but I wonder how many of us have taken advantage of his knowledge of Chinese language and history -- the focus of his university study and teaching. The Rev. Anne Richards will have the use of the rectory during her stay in Guilford for the Sundays of July 10, 17, and 24. Following her service in the Diocese of New York, Anne+ had a distinguished ministry with St. Mark’s Church in New Canaan. Her husband, the Rt. Rev. Richard Grein, retired bishop of New York, may accompany her on occasion. So what will I be up to? In June, I plan to continue the work I began last year in the Advanced Degree Program at the School of Theology of the University of the South in Sewanee, Tennessee. With the sabbatical, I will have time to finish the classwork on my time and not the parish’s. Through this work, I hope to have more resources for ministry with you -- especially for preaching. After returning to Connecticut, I expect to officiate at a Service of Thanksgiving for the Life of parishioner Barbara Letts at Christ Church on Saturday, July 2. Then I will head to Oregon for time with my family, and then to Cape Cod for time with friends. By then I will be more than ready to return, rested and refreshed, to my home and the life I treasure here in Guilford, with you. Thank you (I think!) for electing me as your Junior Warden. You know that you have started your first term when an usher walks up to you and hands you a broken kneeler stop on the same Sunday as our Annual Meeting and voting! In this report I am going to talk about the approach that I am taking to start resolving a list of issues that Harrison and I compiled. The list is made up of issues/projects that have been identified and are not resolved as of yet, plus new-found items or requests reported by parish members. These items were found both in and outside of the church, parish house, and rectory. A Thank You goes to members of the parish who have been identifying issues and problems. Your input is very important and much appreciated. The list was compiled and statements of work were given to contractors for bids. Next step was a meeting with Harrison and then with the Finance Committee to request funds. I first had to find a balance between what issues were safety-related and what items were deemed critical. We then had to match cost of those items to the availability of funds. This is always a challenge. The next step in the process was to put together a proposal and present it to the Vestry for approval. Items that were approved by the Vestry and completed as of this report date are: (1) Repairing a loose bit of sheathing that was sticking up on the rectory roof -- an issue that could have led to greater problems. (2) The thermostat for the church was not functioning properly; a new 7-day energy-saving thermostat is now installed. (3) A walkway of broken slate tiles – a safety concern -- that led out from the Robing Room steps has been replaced by a concrete sidewalk connecting to the walkway between the parking lot and the front of the church. (4) Repair work on the back-yard fence will start the week of May 1; all gates will be repaired, broken slats repaired or replaced throughout the fence, and downed sections will be uprighted. Items approved and yet to be completed: (1) Parish house roof nail “pops,” (2) gutter cleaning, and (3) installing a new exhaust fan in the currently unvented parish house attic (it will function automatically as temperature and humidity dictate). The pull-down steps leading to the parish house attic storage area are difficult to operate and under review for repair versus replacement. In the good news department: Many thanks to Chef Antonio Greco for cleaning the massive filters in the hood over the parish hall kitchen range, and reporting that they and the exhaust system are in good order. Thanks also to David Oshana for installing an appropriate lock in the Nursery lavatory. On April 24, our seminarian, Stephen Douglas, gave a talk in the Parish Hall during the coffee hour on his recent trip to Rome and Canterbury Cathedral, a trip taken with several of his fellow Yale Divinity School students. He showed pictures of the awe-inspiring cathedrals and stained glass windows associated with our Christian faith, and also got to see the Pope during one of his outdoor audiences. It was a wonderful presentation, and we thank him for sharing this experience with us. ​The Evening ECW continues hard at work! Since our last report, we have commissioned plans for updates to the Parish Hall from Patriquin Architects of New Haven, and those plans are now complete. We have held two informational sessions for the parish to let folks know what we're planning and to solicit input from the most important users: our church family! We hope to put the first phase of the project up for bid this summer and to begin on construction as well. We held a very well-attended dessert social in April to kick off our Tag Sale, which will occur on September 24 this year, and have committee chairs for each of the functions needed to make the sale a grand success. However, we cannot do it alone! We need your help to make it happen, especially during the week leading up to the sale and on the "day of" as well. Rebecca Ervin is our Volunteer Chair this year and she can be reached at reervin69@gmail.com. We have begun collecting donations of household and other items, and these can be brought to the church either during office hours or on Sundays. As we did last year, all Tag Sale items will be stored in the EECW room on the Sunday School level of the Parish Hall. Please keep clothing and furniture at home until September, and if you need a pickup for any items, please contact Jane Ferrall at jjferrall@yahoo.com. We will continue meeting on the first Thursday of each month, from 7-8 p.m., throughout the summer. July will bring another cool social, so watch those emails! ​Our ECW wishes to thank everyone who recently supported our "Roses for Mothers" and "A Rose for Mommy" project. We displayed over 300 roses on Mother's Day!!! What a beautiful sight. We donated 10 bouquets to the Pastoral Care committee for delivery to the homebound. They certainly brightened the day for those who were unable to attend church services. We also wish to thank you for the donations of new socks and underwear for men, women, and children. The men's items were brought to New Haven by Leland Hubbard. They were given to homeless men during the distribution of food at the Midnight Run project on the Green. Lee has participated in the Midnight Run project for several years. Thank you, Lee!! I delivered to Ella's on the Guilford Green the undergarments for women and children residing in women's shelters on the shoreline. You were very generous in the items we collected. Thank you for your support. This is an ongoing Outreach project. to see the architect renderings for the Parish Hall? Well click here to go to the page containing the plans! ​We ended this ECW year in celebration, both at our annual church picnic on Sunday, June 5, and on Thursday, June 9, at our annual June Luncheon. 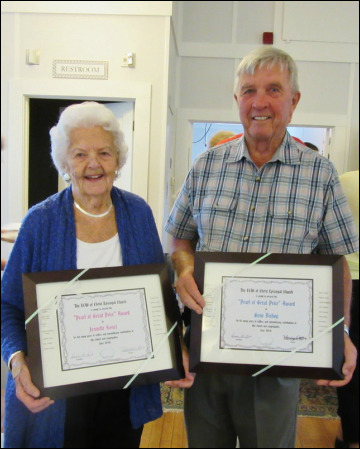 This past spring, Diane Barker suggested that there were many hard-working, selfless individuals in our parish who should be recognized for their contributions. We all agreed that we wanted to recognize two such individuals this year and others in the future. So the "Pearl of Great Price" award was created and was awarded this year to Gene Bishop and Jeanette Koncz. Both are well deserving of this award, and the women of the ECW are proud to recognize their devotion to our parish and congregation. Our annual luncheon was held at the Maritime Grill on Thursday, June 9. We had a lively group of 22 ladies that enjoyed this popular ECW activity. Thank you all who attended and all the good sports who played our FUN exchange game. We also held a free-will collection to support the Diocese of Connecticut’s ECW White Envelope project. Thank you all in your support of this program that gives grants to Connecticut Episcopal churches that apply for funds to provide needed programs or services in their community. They have also given grants outside of our diocese when applications are received and meet the requirements. Usually two grants are awarded annually. Our next regular meeting will be held on Thursday, September 8, with an 11 a.m. meeting and 12 noon carry-in luncheon. Our hostesses will be Diane W. Link and Cindy Smith. The program will be a planning session for our upcoming year. Our first fundraiser of the 2016-17 year will be a "Holiday Military Whist" on October 14 at 7 p.m. in the parish hall. Tickets will be $8 each, and table reservations may be made in advance. They will be available at the EECW tag sale on September 24. All Christ Episcopal Church Women are members of our ECW. Our regular meetings are held on the second Thursday of each month, at 11 a.m. in the parish hall, with a carry-in luncheon at 12 noon with a program to follow. We do not have meetings in the summer. We meet all other Thursdays after Bible study, at 10:30 a.m. in the Guild room. We bring a sandwich and a hostess serves tea and dessert. Please join us! ​On Sunday, June 5, we will celebrate a year of Sunday School, Middle School, and High School (Young Adult Program) classes and activities. We’ll give thanks for the dedicated ministry of our Sunday School teachers and mentors during the 10 a.m. service, and we will greet five newly confirmed youth. They will have been confirmed at St. John’s Church, Essex, with 45 others, on the day before! The celebration will continue at the Annual Parish Picnic. I think we all look forward to hamburgers and hot dogs from the grill and the wonderful potluck array of salads, sides, and desserts that you all provide. While I cannot guarantee beautiful weather, I will continue to do my best with the “Committee on Weather”! The Choir will conclude their program year of musical leadership on Sunday, June 12. To help celebrate a Year of Music, they will also host a festive Coffee Hour. Please plan to join the celebration! Noted the beauty of Holy Week and Easter Services; received the Rector’s thanks for the new dishwasher and microwave in the rectory (replacing barely working equipment); and rejoiced in the success of the Youth Spaghetti Supper. Received Treasurer Ted Sands’s report for March and the Year-to-Date -- income from pledges in March was below that of 2015, even with Easter being a Sunday in March; pledged income in 2016 to date is also below expectations and last year’s experience by 16%; nonetheless, Christ Church parishioners typically fulfill over 97% of what they have pledged and in 2015 gave more than 100%; the parish’s expenses are fairly steady quarter to quarter, and with prepaid pledges the parish is able to meet its expenses. Received a detailed report from Junior Warden Susan Shackford on the status of our buildings and grounds. Sue underscored needed repairs to roofs, fences, and the pull-down stairs to the Parish House attic; Sue also reported on the need to replace the hazardous walkway to the robing room (now broken slate tiles) with a proper sidewalk, and to properly ventilate the currently unventilated Parish House attic. The Vestry authorized the roof and fence repairs and installing the attic vent, to be paid from the operating budget, and the sidewalk to be paid from Capital Funds. Discussed the results from the Vestry Workshop on April 9, going over “opportunities” for Vestry attention; and heard plans for the parish to review the results of the fall Hymn Sing and the fall/winter Home Gatherings, to culminate in a May 1 parish supper. Learned that preparations for a new Parish Directory were under way, with details in a letter to be sent to parish households, and all were actively encouraged to participate. Will meet next on Wednesday, May 18. ​On May 5, five members of Christ Church ECW (Diane Link, Diane Barker, Cindy Smith, Rhoda Whitman, and Jean Valentine), along with our rector, Harrison West, journeyed to Aqua Turf in Plantsville, CT, for the 135th Annual Meeting of the Episcopal Churchwomen in Connecticut. After signing in and perusing the various tables and exhibits, the meeting began with Bishop Ian Douglas presiding over the Holy Eucharist and Bishop Laura Ahrens delivering a moving sermon on the Ascension. Various reports followed, with LaDene Monegan, UTO chairman, reporting that a little over $13,000 was taken in at the November Ingathering. The speaker at the meeting was the Rev. Lindsay Hardin Freeman, author of two books on women in the Bible, The Scarlet Cord, Conversations With God’s Chosen Women, and Bible Women, All Their Words and Why They Matter. In the latter book, she and a small group of researchers combed through every book of the Bible and found out that 93 women spoke 1.2% of the words in Scripture. Many of them came at pivotal moments, such as Rahab hiding the Hebrew spies prior to the battle of Jericho; Lazarus being raised from the dead at the home of his sisters Martha and Mary; and, most important of all, Mary saying YES to the angel Gabriel, consenting to be the mother of Jesus. Following a delicious lunch, Bishop Douglas closed the meeting with a benediction. We look forward to the 136th meeting next May! ​The regular April meeting was held on Thursday, April 14, 2016, at 11 a.m. in the Parish Hall, with a carry-in luncheon at 12 noon. Our hostesses were Diane Barker and Jeanette Koncz. We did not have a program, but discussed the “Roses for Mothers” and “A Rose for Mommy” fund-raiser set for Mother’s Day, Sunday, May 8. The proceeds of these projects will be given to the Altar Guild for the White Hangings Fund and also to the Acolytes program for their Washington, DC, trip to the National Cathedral. We also made a decision to distribute the men’s socks and underwear we collected, to be brought to the New Haven Green via the Midnight Run program. The women's underwear and socks will be brought to Ella's on the Guilford Green, to be given to a women's shelter. We decided to hold our annual June luncheon at the Maritime Grill, Rt. 1, Guilford. We will meet at 12 noon, on Thursday, June 9. Further information will be posted on the bulletin board outside of the Guild Room and in the Sunday Bulletin as soon as all details are final. We will have our gift exchange game. Set the date aside now, as it is always a fun afternoon! There will be five of our members, plus Harrison, attending the annual Diocesan ECW meeting on Thursday, May 5, at the Aqua Turf. We are looking forward to spending the day with other ECW groups from Connecticut and sharing time with old and new friends. Our next meeting will be held on May 12, at 11 a.m., with a carry-in luncheon at 12 noon. Our hostesses will be Jean Courtney and Hope Sperry. Wendy Bellmore, of Christ and the Epiphany Episcopal Church, East Haven, will be our guest speaker. Wendy will be going to Mozambique as a medical missionary this summer. She recently retired from both the West Haven V.A. Hospital and the U.S. military and is looking forward to this missionary experience and sharing with us what she will be doing. 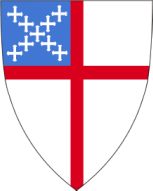 All Christ Episcopal Church women are members. We meet on the second Thursday of each month at 11 a.m. for a regular business meeting with a carry-in luncheon at 12 noon. These meetings have two hostesses. All other Thursdays we meet informally in the Guild Room. We bring our own sandwich and a hostess makes tea and provides dessert. We hope you will join us!